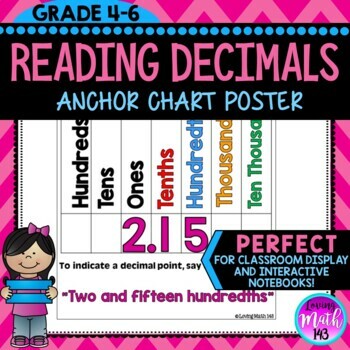 This anchor chart poster is a great tool to display in your classroom. Students will be reminded of the place values. The product not only shows the place values but also displays how to properly read decimals. For example, we read the decimal point as the word "AND". ★ Hundreds, tens, one, tenths, hundredths, thousandths, and ten-thousandths place values. ★ How to read the decimal point. ★ An example that 2.15 is read as, "two and fifteen hundredths"